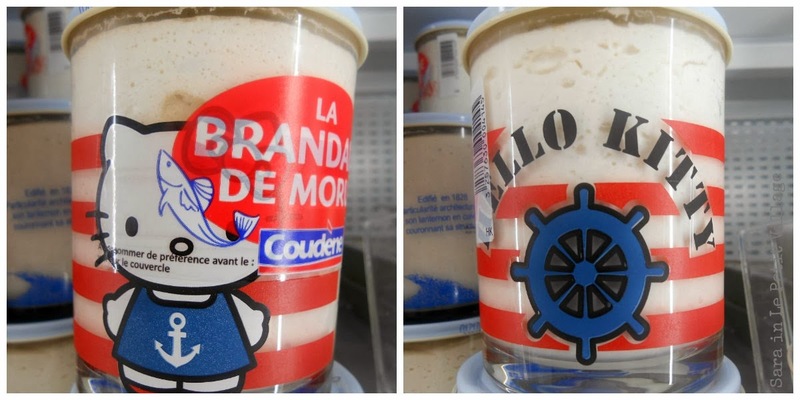 I love brandade de morue, not sure I'd go for a Hello Kitty jar though! And no way I'd be eating those fish balls with a hangover, you must have a strong stomach! The only way those olives and anchovies would cure my handover would be by causing me to vomit every single bit of the previous night's revelry! Gross! I eat cereal the same way - always mixing at least two together, but I would NEVER let any fall on the floor. Not my previous breakfast! Tsk tsk, Gregory! I just love these, so funny! WTF indeed! Congrats on the free samples. Those eyeballs look perfect for a hangover. Hahah! I love this cereal concept. I have never thought to do that before! I mean, anchovies and olives would probably cause projectile vomiting, and if you're hungover, sometimes vomiting is the best possible scenario, soooo. ^^^ it's actually under "Sugar Addict" (I think?). Not sure how I feel about the anchovie wrapped olives for a hangover cure, it would be interesting thats for sure. My sister use to always mix her cereal as well and she never failed to make a huge mess! Not a huge Hello kitty fan, and all i can think is "did they really get authorization to use hello kitty on their package?" Alien eyeballs is the perfect description. Those are a little over the top for my considerably adventurous palette. Plus, I cannot even imagine how salty that combination is. I might be laughing a bit at the serial incident, sorry! Oh my gosh they're ruining Hello Kitty! Fish paste?! That's crazy! Suddenly my panini press with Hello Kitty grill marks emblazoned on the grill plates is no longer a bad logo placement when compared to the fish paste placement. Morning would be too early for me to do anchovy eyeballs no matter how big my hangover. I would take Heather's approach to cleaning all that cereal on the floor. Unfortunately, my dog would just sniff and walk away. Very funny post. Haha, Heather! Absolutely. Fifty is beloved by many of us, but even more so by me now I've seen his wine toting skill! That could well be the oddest place I've seen kitty. Hilarious. Fifty with barrel has also totally made my day. Wow the alien eyeball food pic made me stare at it for a good 30 seconds lol!!! And mad love for hello kitty products! I've just followed you on GFC, looking forward to your next post love!! haha. the cereal boxes 'f' hits very close to home. why oh why must boys do these things? the other half of the bottle is encouraging him not to go through a box every few days, grabbing another bowl every time he's slightly hungry. Haha that picture of Fifty is hilarious! :) Thanks for making me laugh! When I saw that Hello Kitty thing I thought it is ice-cream! Weird way to sell fish! I got your Christmas card by the way! You are such a sweetheart! :)) Thank you so much, it made my day...although I have not opened it yet, I want to wait until Christmas! Those anchovies + olives look like something you'd get in Spain along with a small beer! Funny.